First, a bit of history before we get started, 10 short years ago I arrived into Queenstown in a similar fashion but in a different place. 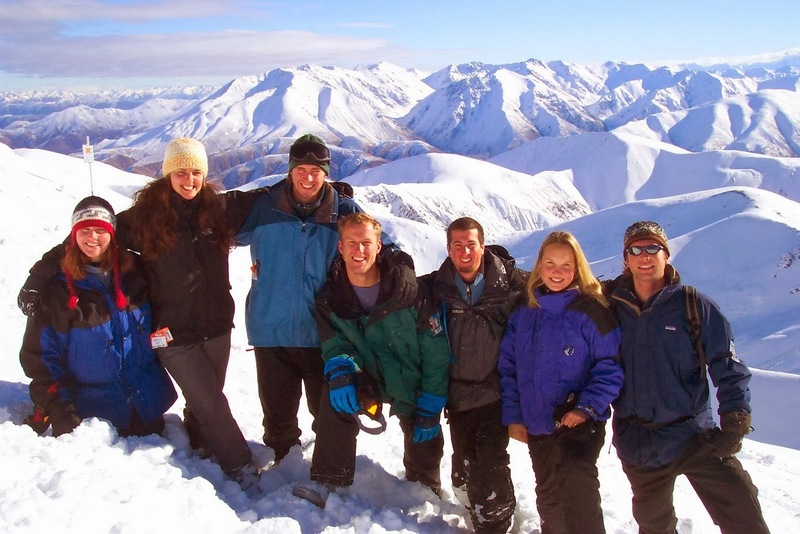 A decade ago, a close group of friends, there were 7 of us total, found jobs and called Queenstown and NZ home for the better part of 9 months. It was a fabulous time and there are no shortage of things that I learned then that shape me into who I am today. Given all that history, it was hard not to walk down the street and not be taken down memory lane a bit. In fact the very first morning we were in town, Kate and I ran into an old friend of mine walking down the street who we then caught up with over coffee. Nothing like a chance encounter like that to make you right at feel home again! So, for the interest (primarily) of my travel partners from 10 years ago, here's a little overview of Queenstown, then and now. The town setting: Spectacular! I mean, thank God these mountains and lakes don't go anywhere because it's just as spectacular as I remember it. Maybe even more so. This is where I first learned that I wouldn't ever tire of looking at the mountains every day. The town is still situated here. Thankfully. 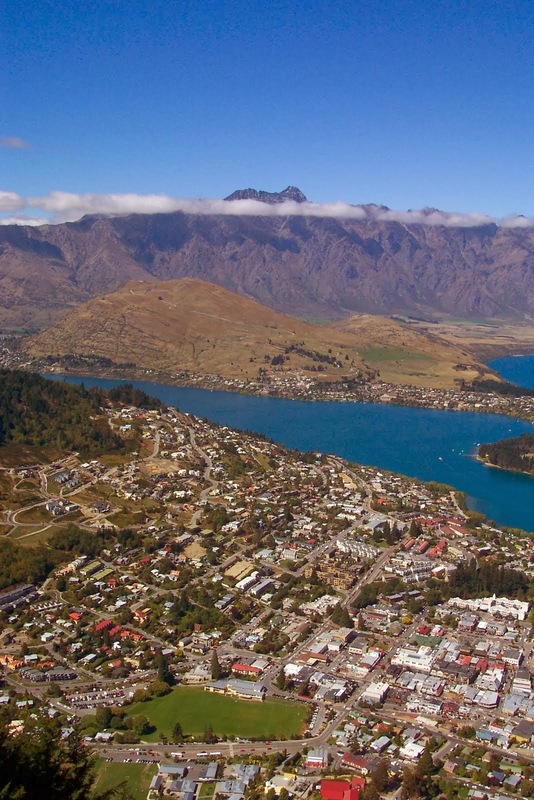 The town itself: 10 years ago Queenstown was definitely a tourist town but only boasted a population of around 12k. There weren't any significant brand name hotels and Subway was the only fast food place in town. Now, the population of the greater Qtown area has almost doubled to over 20k; more and more brand name hotels are making their way in and the town has a Subway, a McDonald's, a KFC, a Pita Pit (really?! ), and a Starbucks. Progress???? Eh. On the upside, the town still retains a lot of its' "small town" feel. The sprawl is actually a lot less than I was expecting. All in all, the town has maintained its' charm without giving up its soul. Yet. Amazingly the town has managed to stay relatively compact, all things considered. The housing: 70 Robins road. Ah yes, the infamous Bachelor Pad and the Nest. Still there, still looking just as good (or dodgy) as they did 10 years ago. (Needless to say, the apartment Mike and Kim rented for us was a significant upgrade from my previous digs in town... this time the apartment was stayed in actually had heat.) If I recall correctly, we paid about $85/person/week for a shared bedroom in an apartment. Looking at the locals message board at the Fresh Choice grocery store, it appears the going rate is closer to $140/person/week. Inflation at work. The coldest (and barest, especially after all of our furniture was stolen) apartment that I've ever lived in. My job: Monty's still there. In fact, this might actually be a place where 10 years ago was way better than now: I was employed! (And gainfully at that, taking home $12 - $15/hour, sans tips.) My former employer, where I bar-tended and managed, is still doing well; the beer has gotten better (IPA on tap! ); the food service has gotten slower (need the old guard to come back to shape things up); and they moved the bar to the side (why?). Although in 10 years the price of a pint of beer has gone from $4.50 to $9.50! Monty's; A familiar spot. Although the beer is a bit more expensive. Friends' employers: Subway, still there. Avanti, still there. Info&Track, still there. Sombrero's; still there. Millennium hotel, still there. Dart Stables, still there. Suz... pretty sure that clothing shop you worked at; still there. If nothing else, our former employers have all managed to employ more than a few transient workers over the past 10 years. Still there... still the same. Tardis, Surreal, and Buffalo Club. Still there. Winnie's, Thai, Ice Bar, and Vudu Cafe. All still there. FergBurger. Still there. Only, major upgrade from a back alley way garage to a prime spot on Shotover Street. The line is horrendous - at times a 30 minute wait to put your order in and then 1.5 hours to get your burger - but the food is still delicious. For my money FergBaker, next door, is the best bet in town. Pies to die for and no shortage of other treats. Plus, never a line. This would be considered a "small" line at FergBurger. Bombay Palace. Still there. Curry night has moved to Wednesday from Monday and the price has gone up to $14 (from $10) but our Indian standard is still there. For a point of reference to everyone else, this was our go to restaurant every Monday night for "Family Night" when all 7 of us would get together to have dinner and drinks. Given our various schedules, it was one of the seldom times we were all together. Of course, we made good use of our time together. Dux de Lux. Replaced. Bardoux, Chico's, Ice Bar. All still there. To be honest, I was honestly surprised by how many places hadn't turned over. There were way more familiar restaurants than new ones. No Scribe plying the airways, although I did hear the Salmonella Dub CD being played at a takeout joint. Just goes to prove, good music is timeless. The Friends: This is probably one of the most surprising and amazing parts of my time back in Queenstown; the number of familiar faces I've been able to see after all these years. Andrea, Jemma, Dom, Blair, (and Louise in Nelson), it was amazing to see you all! You made it feel like home, even after all these years. The Family: Omnipresent. 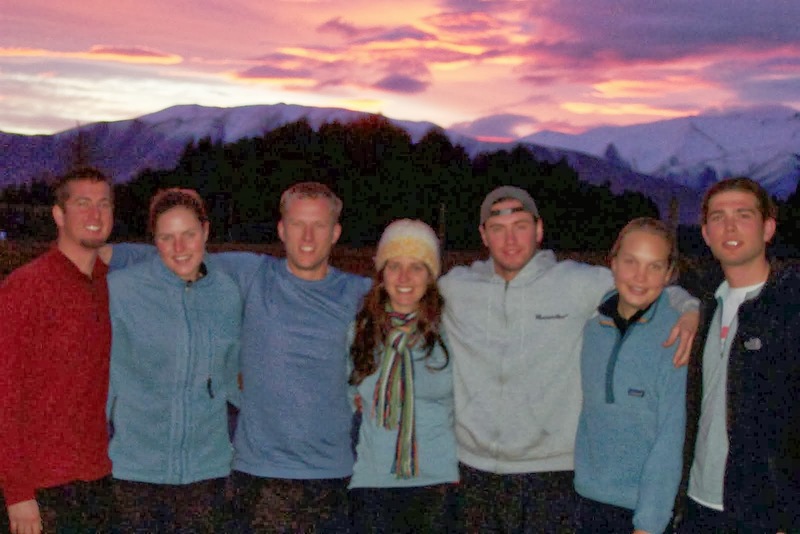 10 years ago, it was a tight knit group of friends who were sharing an exciting year together half way around the world from their friends and family. This time around, it's even better having another family to share this amazing place with and make new memories. And this is for the family that can't be with us"